Found in low, sheltered tidal marshes and wetlands, usually living on needlerush and saltmarsh cordgrass stalks. Common in the middle and lower Chesapeake Bay. Marsh periwinkles grow to 1 inch in length. Their spiraling, grooved shell has a slightly pointed spire and varies in color from grayish-white to tan. 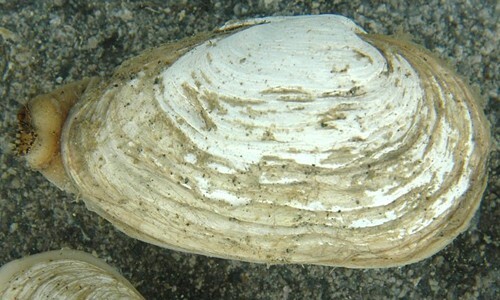 Reddish-brown flecks appear on the spiral ridges of the shell. The marsh periwinkle grazes on algae and detritus on the surface of plants and the ground. Blue crabs, mud crabs and terrapins prey upon marsh periwinkles. It will avoid predators by climbing up marsh grass stalks. Marsh periwinkles lay individual eggs into the water. Eggs hatch into free-swimming larvae, which develop into small snails in mid-summer. A marsh periwinkle use its gill to get oxygen from the water. Marsh periwinkles are gastropods, a type of mollusk that includes whelks, snails and slugs. 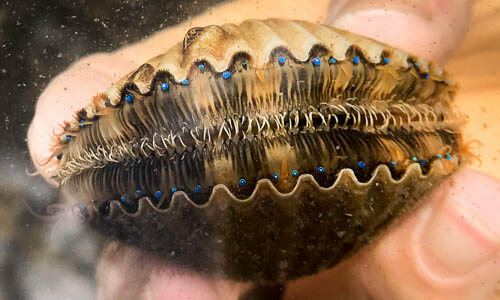 These snails are known to practice "fungiculture": by chewing holes in the cordgrass and spreading waste across the cuts, the marsh periwinkle can "farm" fungus, their preferred food.